EyeCon is based on the ultrasonic pulse-echo method using transmitting and receiving transducers in a “pitch-catch” configuration as illustrated on page 96. 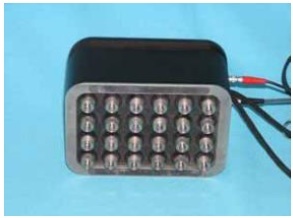 EyeCon uses an antenna composed of 24 transducers arranged in a 4 by 6 array as shown to the right. 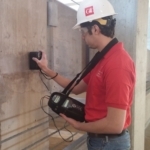 Each transducer is independently spring loaded to conform to surface irregularities. As is shown below, the first three rows of transducers act as transmitters and the other three rows act as receivers. By using the multiple transmitters and receivers, the signalnoise ratio is improved because random reflections from aggregate particles will tend to cancel, while reflections from large concrete-air interfaces will be superimposed. 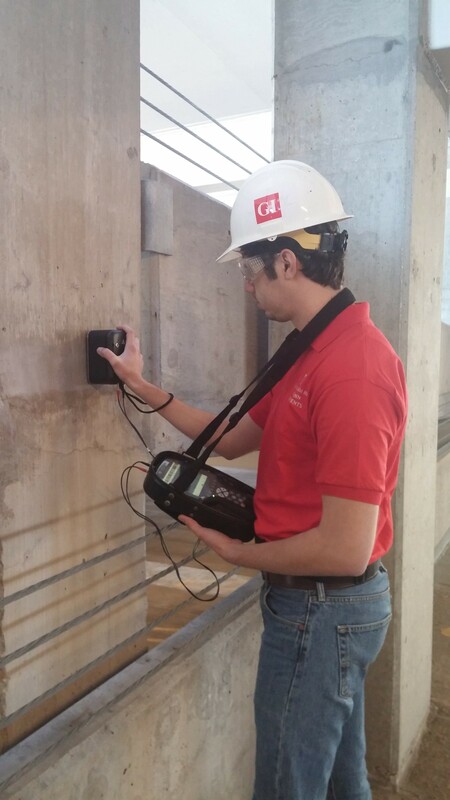 The averaged signal recorded by the receiving transducers is stored in the hand-held unit as a time-domain waveform. An example of such a waveform is shown at the top of the next page. 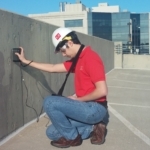 In this case, the test was done on a solid concrete slab with a thickness of about 200 mm. 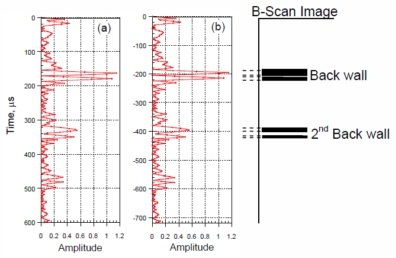 The figure on the left side of the next page shows signal amplitude as a function of time (A-Scan). The three peaks are due to multiple reflections of the pulse by the back wall (bottom) of the slab. The figure below is the rectified version of the signal in which the negative portion of the original signal is plotted as a positive signal. EyeCon allows the user to display the signal as recorded originally (left side) or as a rectified signal. The latter is preferred because it allows more detail in the display. 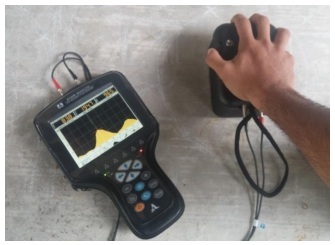 These time-domain signals of the received pulse are used to measure the solid thickness or detect the presence of voids or cracks within the test object. The use of a 4 by 6 array of point transducers to introduce into the concrete pulses of shear waves with a nominal center frequency of 50 kHz. The use of the array increases the signalnoise ratio at the test point. The transducers are spring loaded to conform to an irregular surface, and they do not require a coupling medium, that is, testing is done in the dry. The signals captured by the antenna are stored as a time-domain waveforms (A-Scans). 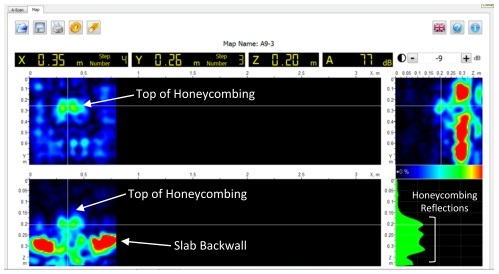 Signals captured in a 2-dimensionl scan can be displayed on the hand-held unit as colored cross sections of the test object (B-Scan and D-Scans) along each scan line. Data can be transferred to a computer for subsequent analysis and construction of a 3- dimensional view of reflecting interfaces with color to represent different signal amplitudes. 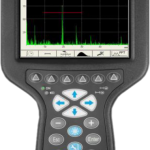 A-Scan—This display mode is used to show the results of individual measurements. The amplitude of the received signal can be displayed as a function of time or as a function of distance (depth) if the shear-wave speed is known. The signal can be displayed in its actual form or in rectified form (preferred). There are two A-Scan display modes: REVIEW and ZOOM. These are described later. B-Scan—This display mode uses the stored A-Scan records to create cross-sectional views along the X direction scan lines. D-Scan—This display mode uses the stored A-Scan records to create cross-sectional views perpendicular scan lines. 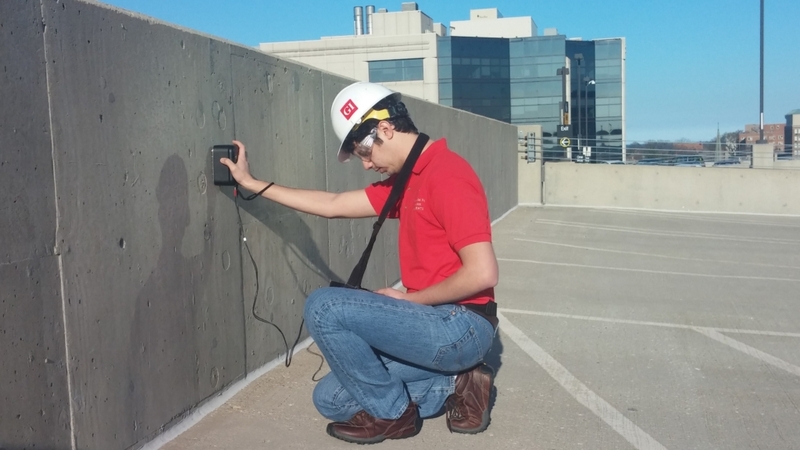 To carry out an inspection of a concrete member, the user first lays out a 2-dimensional grid on the testing surface. The grid lines should have the same spacing (step) in both directions. The step spacing depends on the size of defects to be detected, with a smaller spacing for smaller defects. The long axis of the antenna is oriented perpendicular to the scan direction and data are recorded at each step along each scan line. The grid layout (step distance, number of steps per line, and the number of lines) is entered into the hand-held unit and that information is used in referencing the displayed test results to the testing position on the test object. After the scanning is completed, the results can displayed be in two ways. The individual A-Scans can be analyzed or cross sections (BScans) along each scan line can be viewed. The following explains the approach used to construct a cross-sectional view of the test object and show the depth of reflecting interfaces. The signal at each test point is plotted with time in the vertical direction as shown in left hand figure (a). 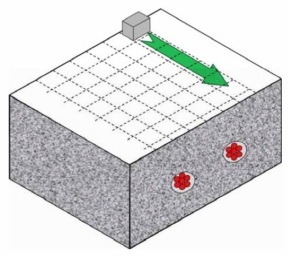 If the shear-wave speed in the concrete is known, the time axis can be converted to distance from the surface by multiplying by one-half of the wave speed (because the travel time is for a round trip equal to twice the depth). If the shear wave speed is assumed to be 2400 m/s, the distance axis is as shown in figure (b). To construct a cross-sectional view, a threshold level of signal amplitude is chosen and a black dash is drawn at the depth where the signal exceeds the threshold amplitude. In this example, a low threshold is used and the second echo from the back wall is plotted. If a higher threshold were used, only the first back wall echo would be shown. This process is repeated for each signal along the scan line, and the end result is a 2-dimensional representation (or a B-Scan) of the locations of reflecting interfaces along each scan line. 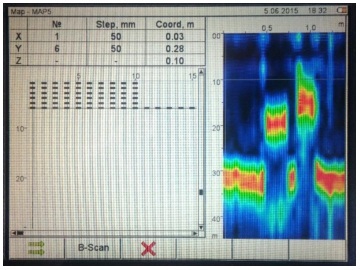 As shown on the right, each scan line has an associated B-Scan plane that can be viewed as shown below. 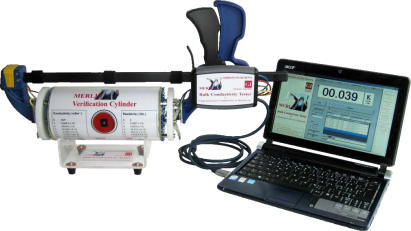 The following are examples of the various displays that are available in EyeCon. 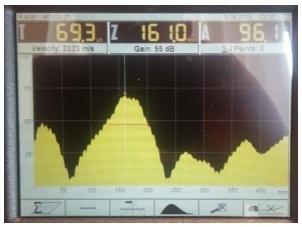 A-SCAN—This display mode shows the recorded signal at a single antenna position. The signal can be from one set of pulses or an average of several sets of pulses, depending on the set up of the instrument. Different display formats are available. In this case, the signal has been rectified and filled in. The horizontal axis is in units of time (microseconds), but it could also be displayed in units of distance if the wave speed is entered when the instrument is set up. Various measurements can be made such time to first peak or peak-to-peak interval. A portion of the signal can be zoomed in for a more detailed view. Also, consecutive readings can be averaged. A-Scans can be saved. MAP—This mode is used to review results acquired if a 2-dimensional testing grid is used. The upper left box shows the grid layout. The horizontal cursor is used to select the scan line for which the B-Scan cross section is to be shown. The vertical cursor is used to select the scan line for which the D-Scan cross section is to be shown. 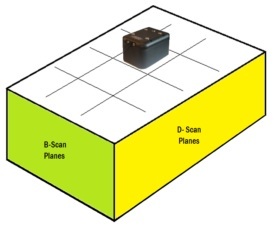 The lower left box is the B-Scan along the selected scan line. The positions of the horizontal and vertical cursors in terms of X and Y coordinates are shown in the top left position of the screen. After collecting data with the EyeCon, all the Maps can be imported to the computer and the Planevisor Software will process all the A-Scans to generate 3-D data. In the software screen, A, B, D and C-Scans are displayed at the same time.